LED ceiling light fixtures of one sort or another is a mainstay of most homes and businesses. Modern ceiling lights come in a variety of forms, types and styles and includes such lighting options as both recessed and surface downlights, track lighting and pendant lighting. LED ceiling light fixtures are attractive and stylish. Here is a look at some various types of LED ceiling light fixtures. Recessed Downlights- recessed downlights have all of the LED ceiling light fixtures mounted up into the ceiling so that the fixtures are not seen. Recessed lighting gives any room a clean and fresh look. Surface Mounted Downlights- Surface mounted downlights are mounted on the surface of your ceiling so that the ceiling fixtures show and add to your buildings décor. Track Lighting- Track lighting is becoming increasing popular for both home and commercial applications. The LED ceiling light fixtures come in a variety of different styles and looks from strictly utilitarian to ultra stylish. Pendant Lighting- Pendant lighting are a type of ceiling light where the light fixtures hang from a chain or wire normally in the center the of ceiling, although they may be placed over a specific set of furniture such as a table. Here at Ultra Beam Lighting we offer a wide range of modern ceiling lights in various styles and colors including LED ceiling light fixtures in black, red, green silver and those with a frosted shade. Our modern LED pendant lights come with both single and multiple bulbs as well as a variety of interesting shapes that will look good with almost any décor. Our pendant lights run from 3 watts to 126 watts. 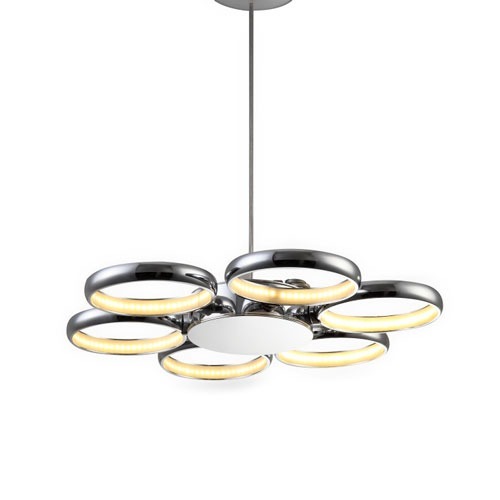 Great Selection- We have a nice variety of ceiling lights including our selection of pendant lighting. Our pendant lights offer you high quality ultra modern designs in a range of shapes, sizes and styles that will fit a number of different decors. Energy Efficient- LED lighting is known for it’s energy efficiency and our LED lights are no exception. We use the latest LED technology in all of our lighting. Since our LED lighting is extremely energy efficient these lights are cheaper to operate than other types of lighting. Long Lasting- Our LED ceiling lights are long lasting providing you with 20,000 hours of lights, making these lights last 20 times longer than more traditional lights. Low Maintenance- Our LED pendant lights require little or no maintenance other that dusting the LED ceiling light fixtures. Deciding which LED ceiling light fixtures are right for your home or commercial décor can sometimes be extremely difficult. Should you like help deciding which of our pendant light fixtures are right for your décor then we will be more than happy to offer you expert advice. Please remember when you have any lighting installed in your home or business the installation needs to be done by a qualified electrician.